1 Long ago, some cultures formed myths and oral legends to explain the fascinating "burps," "rumbles," and "hiccups" of the earth. Native American and other cultures explained the seasons by using the constellations. The gods and goddesses were the reason the grounds rumbled and fire spit from the Earth. Although constellations, myths, and deities offered a fascinating look at the Earth's mysteries, modern science uses careful observations to search for the answers to these mysteries. It is these observations along with natural occurrences that are used to explain and understand the Earth's changing landscape. 2 Chinese scientists kept records of earthquakes as early as 780 B.C. The Ancient Greeks organized a catalog of rocks and minerals around 200 B.C. The Maya built observatories to track the movement of the sun, the moon, and the planets. They used their observations to create accurate calendars. All of these scientific discoveries were based on observations with the unaided eye. Once the telescope and microscope were invented during the 17th century, new worlds once hidden were opened up to the scientific eye. This is when earth science began to take shape. Earth science is the study of the Earth and its surrounding universe. There are four major areas of earth science: the solid earth, the oceans, the atmosphere, and the universe beyond space. 3 Scientists who study the solid earth are called geologists. Geology is the study of the Earth's origin, history, and structure. Geologists are also concerned with the processes that affect the Earth's structure. Within geology, there are specific areas of study. Some geologists focus on the Earth's crust, searching for coal, oil, gas, and other resources. Others focus on the Earth's seismic activity to help predict and analyze earthquakes and volcanic eruptions. Finally, the history of the earth is extremely important to our understanding of our planet. Some geologists study the fossils that have been left behind to learn about the Earth's past. 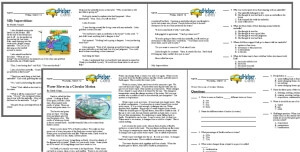 Feedback on What is Earth Science?